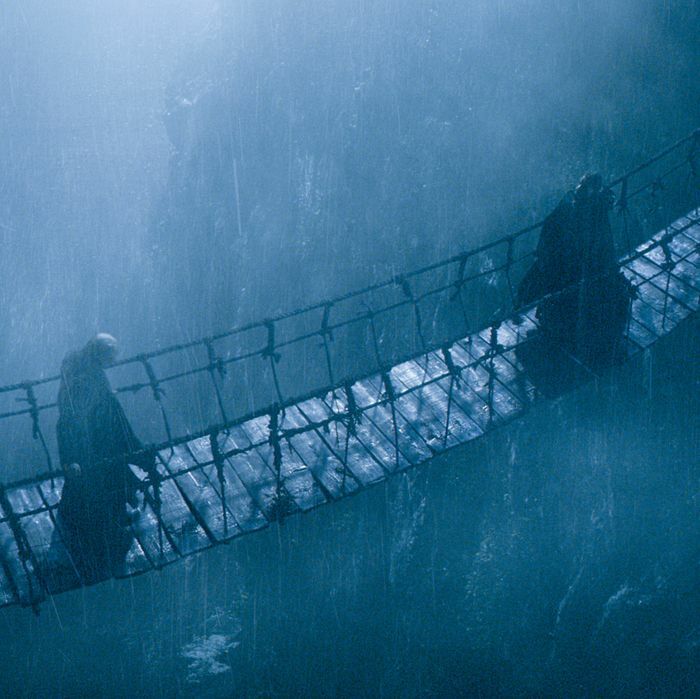 It’s like Chekhov might have said, had he been a Game of Thrones fan: You don’t introduce a windswept castle with towers held together with swinging rope bridges if you’re not eventually going to toss someone off one of those bridges. And on Sunday night’s episode, we finally got our answer, when Balon Greyjoy met his end via bridge fall. (Not a hard guess, since GOT’s Pyke scenes usually feature a cast of … two.) But who was the hooded man who tossed the would-be king of the Iron Islands to his death? That’s Balon’s younger brother Euron and if you had trouble keeping up with the dialogue in that scene, here’s what you need to know about him. [Euron] is not culturally Ironborn at all. He is a fully integrated citizen of the global misery-economy; he is the epitome of the horrorshow-helix that we see throughout Dany’s chapters … He belongs to the flux, the slipstream, the spaces he can exploit to achieve his personal catharsis in causing pain, in a manner untethered to the Old Way … Euron conquers and absorbs ideologies, reaching into the story source code to bring meta-narratives to their knees and force them to work for him. So where does he go from here? First, he’s got to get through the kingsmoot, the Ironborn practice of electing their new kings. From there, it will be fascinating to see how much of Euron’s book story line makes it to the show. The rest of his brothers have seemingly been cut for time — though the Ironborn priest seen in episode two may turn out to be his youngest brother, Aeron — and the show’s untangling of George R.R. Martin’s Meereenese Knot may mean that TV-Euron will take a different short-term path towards achieving his goals. But in the long term? Well, there’s a reason Song of Ice and Fire fandom has been debating a scenario they call the “Eldritch apocalypse.” You don’t introduce a new villain this late in the game if he’s not going to make a major splash, and Euron’s presence is a sign that, finally, Game of Thrones’ political and magical plot threads may be starting to merge. Who Was That Guy on the Bridge in GOT?